For many animals grooming is targeted to ensuring that they look nice. However for cats, the act of grooming can be important for more than just their appearance. To make sure that you understand why you should groom and how best to go about it; we have put together our How to guide on grooming your cat. Cats are great at looking after themselves however there are some occasions which will need you to help out. This could be times when your cat is not well or they are getting a little older. Sometimes older cats stop grooming themselves so will need to be helped out. Everyone loves stroking their cat but what if you run your hands through their fur to find it matted and full of dirt? Grooming can stop this from happening. It can also stimulate circulation in a cat and helps remove the loose hair and dirt which can cause hair balls to form. Not only this but grooming your cat allows you to search for any parasites that could be hiding away in their fur; and no-one wants to see any trespassers coming into your home as a stowaway on your kitty! It is up to you where you decide to groom your cat; your lap is fine if you already have a great bond with your cat. For those who are unsure about whether they may end up being scratched then a table with a blanket or towel on will work just as well. Hopefully your cat will be welcoming to a grooming session with just a little reassurance and some gentle stroking. If your cat is a little squirmy you can grip the scruff of their neck. A natural relaxing reflex for a cat. There are some crazy inventions out there which look as if they would distress your kitty. Don’t forcibly restrain your cat and don’t use a muzzle. If your cat does not want to be groomed pick another time. Be kind and gentle. It is best to start by following the line of the coat down to the tail, breaking up the matts with your fingers. It is important to do this gently so that it does not pull on your cat’s skin. Once you have removed those matted sections then you should use a comb to remove any debris. Combs are better than brushes as the get right down to the bottom part of their coat. This will really help to prevent dandruff and give your cat some glossy shine too! Be careful when picking a comb. Make sure it is not sharp, some cheap combs are not finished well. If you get a new comb try it out on yourself first. If it is spiky for you it will be spiky and sharp for your cat as well. Cheaper is not better. Find a good comb which will last a long time. Make sure you work quickly over the sensitive tummy and leg areas so as not to irritate them. Be sure to leave the tail to last, holding the base and combing a little bit at a time. Pro Tip :Remember to give your comb a quick wash after you finish. It will keep it looking and smelling great and will prolong its lifespan. It isn’t just their fur that needs grooming. Often cats will suffer from weepy eyes (or even just some dinner around their mouths). This should be cleaned using a specialist pet wipe. Ever wondered how to groom your cat? 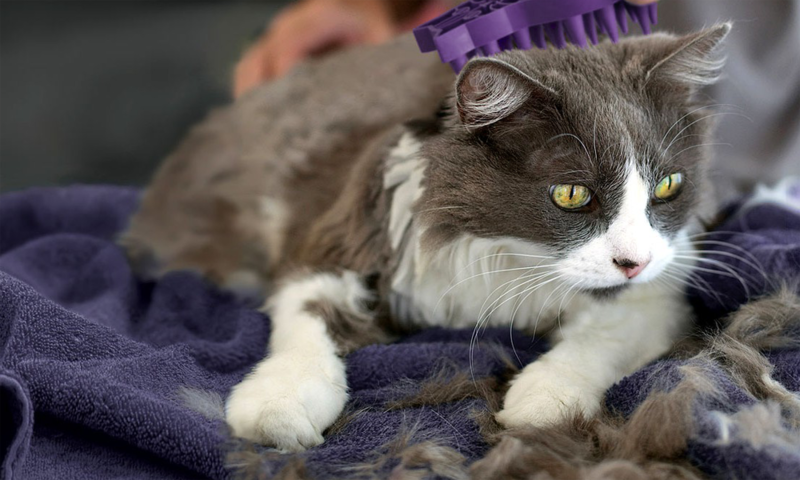 Our quick and easy guide will help you out with some easy to follow instructions and helpful hints on grooming your cat. This entry was posted in Cats, Health and tagged Brushing, Cat, cats, Grooming, health.